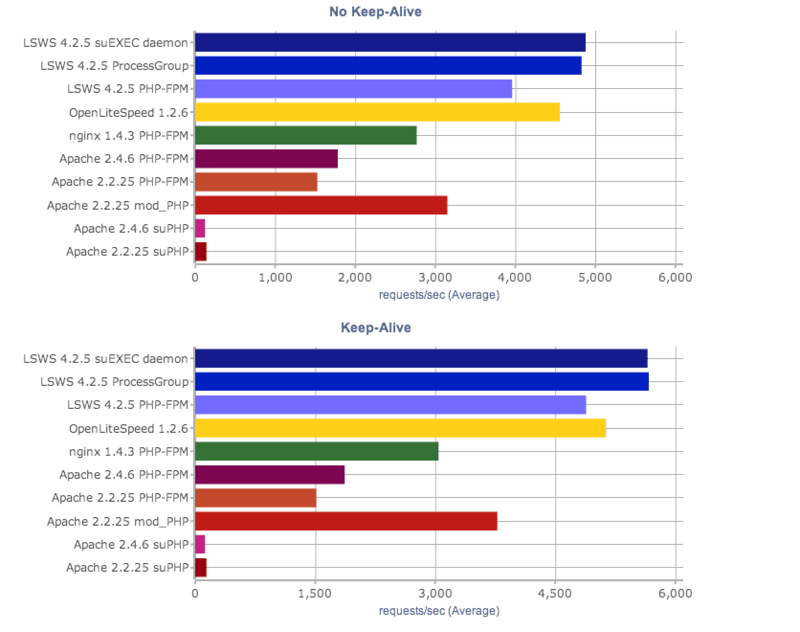 LiteSpeed’s latest benchmarks show overwhelming superiority in PHP performance over Apache and nginx. The results here were even more staggering than our small static file benchmarks, with LiteSpeed more than 40 x faster than Apache with suPHP and about twice as fast as Apache or nginx with PHP-FPM. Full results for our PHP Hello World benchmark. LiteSpeed Enterprise tested essentially the same with suEXEC Daemon mode and ProcessGroup in both tests. First and foremost, LiteSpeed is faster at serving PHP than all other web servers. No matter the setup, even when using the same PHP-FPM backend, LiteSpeed Enterprise and OpenLiteSpeed handily beat all comers. Our code is just more optimized. LSAPI is still faster than FCGI. PHP-FPM uses FCGI. suEXEC Daemon mode and ProcessGroup both use LSAPI, LiteSpeed’s unique server API, for communication with the PHP engine. In the tests, switching LiteSpeed to PHP-FPM caused a significant decrease in performance. In the test we tried to remove as many other variables as we could, using the same hardware and purposely keeping the script size miniscule. The goal was to demonstrate pure speed differences when serving PHP. As we noted in the last test, this is just one facet of web service. We are building up to more complex situations, including web applications. We’re very interested in your feedback. Get in touch with us on our forum. You can find the test configurations and hardware specs with the benchmark results. We’d be happy to hear any objections you have. We encourage you to reproduce the test yourself and suggest any changes you would like to see. Sorry for not replying earlier. I missed your comment somehow (perhaps because of Thanksgiving). But I’ve got just what you want: case studies. Over the next few months we’ll be releasing a series of case studies showing the effects of LiteSpeed in real-world settings. A case study showing LiteSpeed’s effect on two high-traffic WordPress sites should be out in the next couple hours. The results are pretty fantastic, but, if you ask around, you’ll find many people with similar experiences. After that, we’ll be coming out with a XenForo case study (hey, we’re reading your mind), then I’m not too sure. We’ll try to keep the case studies coming out as steady as possible and cover as many different situations as possible.